Ben Ludolphy has managed to find some information regarding this 1930 DKW amongst his archives. 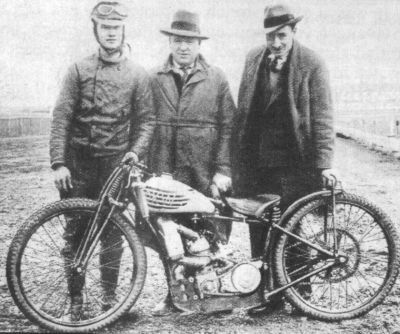 "The machine was raced by Stewie St George (New Zealand) and Fritz Niemeck (Germany). The front fork were adjustable for rake, and by adjusting the rear wheel the wheel base could be varied as much as three inches. The engine plates were made of duraluminium. In the beginning the engine produced 23 Bhp@3800 but after a little bit of tuning, the power was 28 Bhp@ 4000 The latest type gave 36 BHP@ 5400 Rpm. DKW - The History. DKW (Dampf Kraft Wagen) was founded in 1919 in Zschopau by an expatriate Dane, Jurgen (sp?) Skafte Rasmussen. Beginning with a simple motor attached to a bicycle, DKW produced reliable, well-designed, two-stroke machines. By the 1930s, DKW was the world's largest motorcycle manufacturer, and racing experience gave DKW the lead in two-stroke technology. DKW flourished through the 1930s and became involved in the war effort in Germany during World War II. After the war the production of items usable in war was forbidden and DKW suffered until reintroducing the RT125 some years later. The RT 125 was freely copied by such famous motorcycle manufacturers as BSA, Harley-Davidson, and Yamaha. During the 1950s the sales of DKW motorcycles slumped and the company eventually went out of business in the 1960s. However, the sections of DKW which remained in East Germany after WWII manufactured motorcycles throughout the 1950s and 1960s under the name MZ. After the reunification of Germany in 1990 the company changed its name to MuZ and is selling motorcycles with ever increasing success at the time of this writing. DKW built a series of single , twin and three cylinder racing machines in the mid to late thirties, all watercooled two-strokes and if this one is watercooled it must be a racing engine as they only built aircooled roadsters most of them were 350cc, some were 250cc and all had variable inlet timing, mostly disc valves ; several had integral piston supercharging ( a third forward-facing cylinder to increase crankcase compression and hence cylinder filling ). John Surtees rode one at the "1000 Bikes" a couple of years ago and the noise was BLOODY UNBELIEVABLE ! DKW also pioneered direct-injection lubrication although I can't see anything on this one and I would guess it to be a petroil type - two-strokes and dope aren't a happy marriage, vane-type blowers get their oil that way anyway and disc valves need it too which is why the Japanese switched to reed valves. Several survived the war and appeared in postwar German roadracing along with the supercharged BMWs (Germany was not re-admitted to the FIM until 1950, so the postwar ban on superchargers did not apply then ).